I almost didn’t write about this one. It’s been about a week, and it’s still a sore spot for me. We ended up not being able to summit, despite the fact that it’s less than 3 miles round trip if you take the winter route (this is where things went wrong). But since I want this to stay directed at people who are just getting into hiking and climbing, let’s talk failures. I’ve written about a couple, and for some reason, I always have a lingering feeling of guilt even when I’m back. I get it, you can’t always complete everything, making it to the peak doesn’t matter, etc. But usually, when it doesn’t work out, it’s my own fault. See Stetattle Ridge, where I got a late start and chose to follow footprints instead of the route that I knew was technically the best way. This was a similar situation. We left Seattle around 6am. Originally we were going to leave the night before, hike to the Twin Lakes trailhead, camp there and get an early alpine start. In retrospect, that still would have been the best idea, given avalanche conditions the next day. 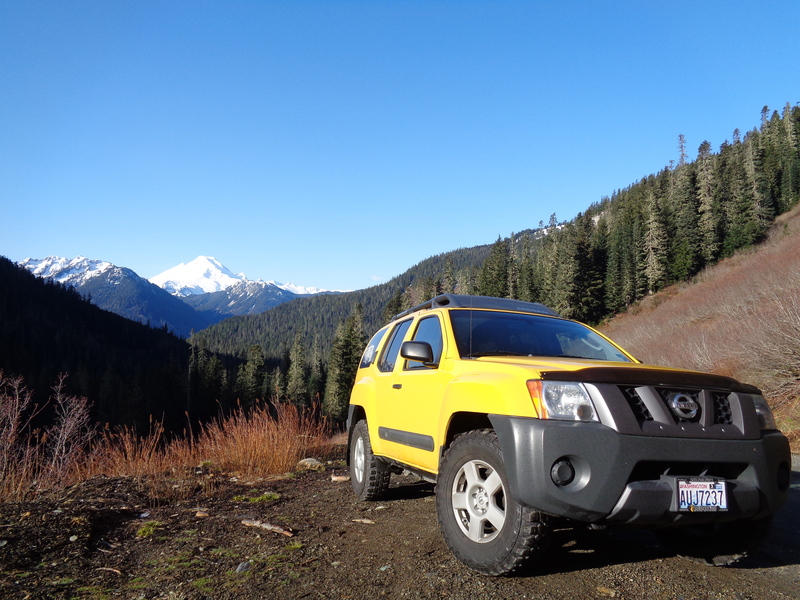 Instead, we arrived around 9am, I had the roughest ride I’ve had on a mountain road since Hidden Lake Lookout (except the Xterra handled it like a piece of cake) and we parked just past the Yellow Aster Butte trailhead and started off. It didn’t feel like hiking a road. Snow covered, narrow, snowmobile and ski tracks everywhere. Views of Goat Mountain were spectacular. Rocky, sharp, and covered in snow, jutting against the sky. 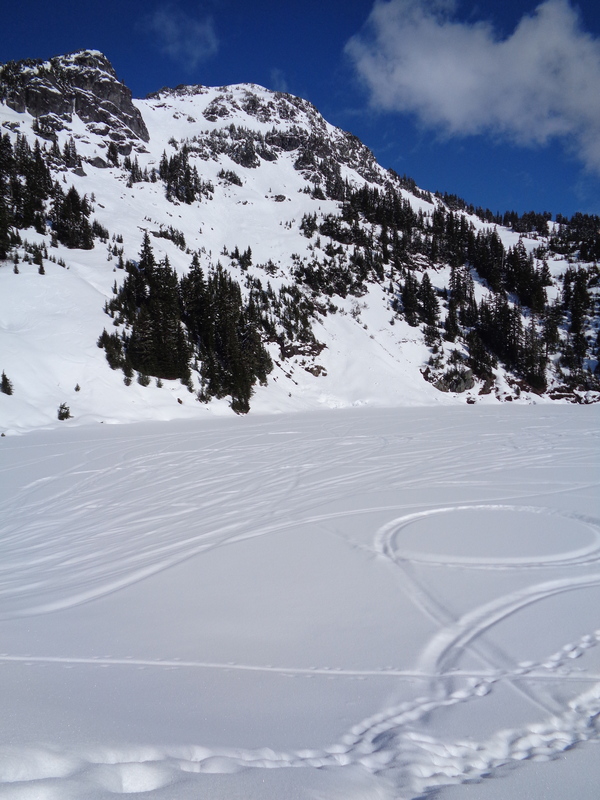 We could see tracks from a party that had climbed up and skiied down, and I’m a little jealous. 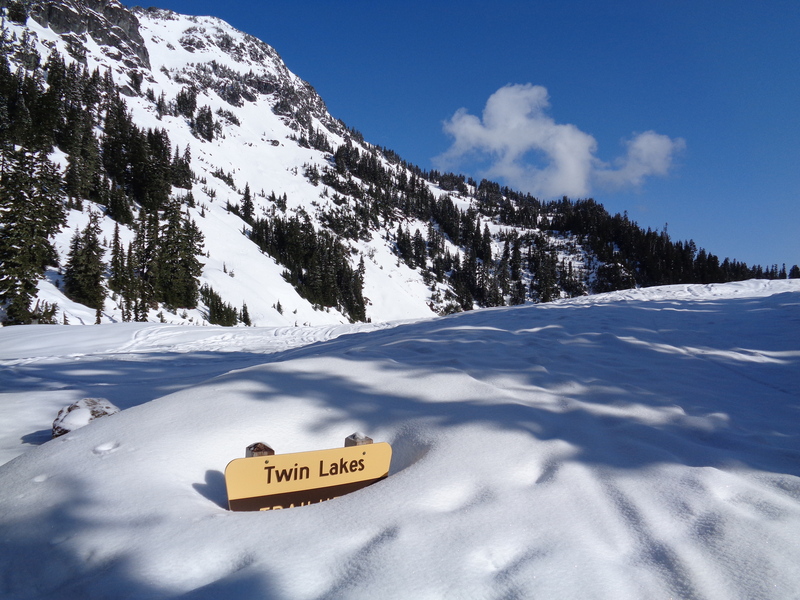 We were at the trailhead quickly, as noted by the TWIN LAKES sign almost completely buried by snow. I was excited to go stand between the lakes, and we cut across the frozen buried surface of one to get to the strip of land in the middle. This is where we went wrong. The summer route starts between the lakes. The winter route, Winchester Direct, wraps around the left side of the lakes, through some trees, and up through an avalanche chute. I didn’t even stop to look at winter vs summer when we were crossing the lake. Past trip reports I had read recommended both, so I figured hey, we were already between the lakes, we’ll give this one a shot. 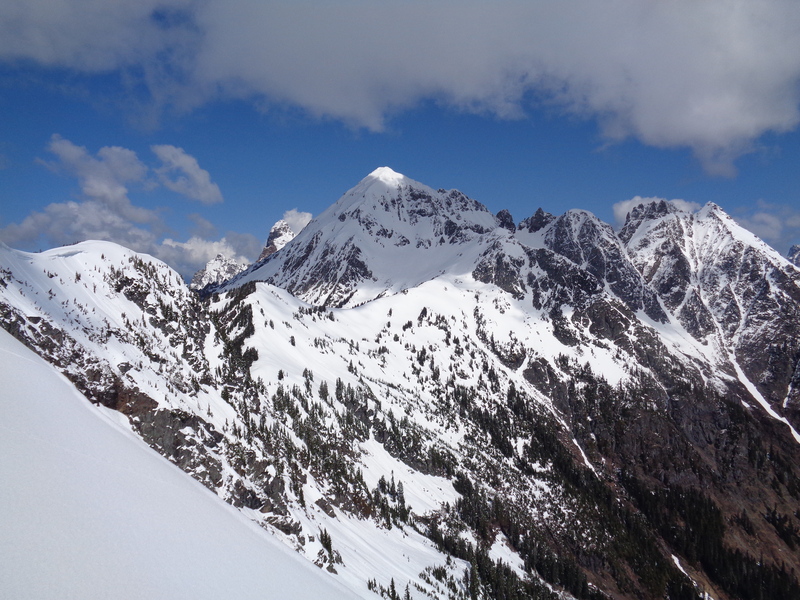 The summer trail usually traverses the face of Winchester, which was all avalanche terrain. We thought we could head straight up to the ridge and then hopefully cut left and follow the ridge to the summit, or wrap behind the mountain. Nope. Snowpack was steep and soft. We followed old tracks hoping to avoid postholing, but it didn’t work. Breaking trail is hard, and we were just in knee/thigh deep snow. I can’t even imagine wading through waist deep snow, and I know it’s been done. 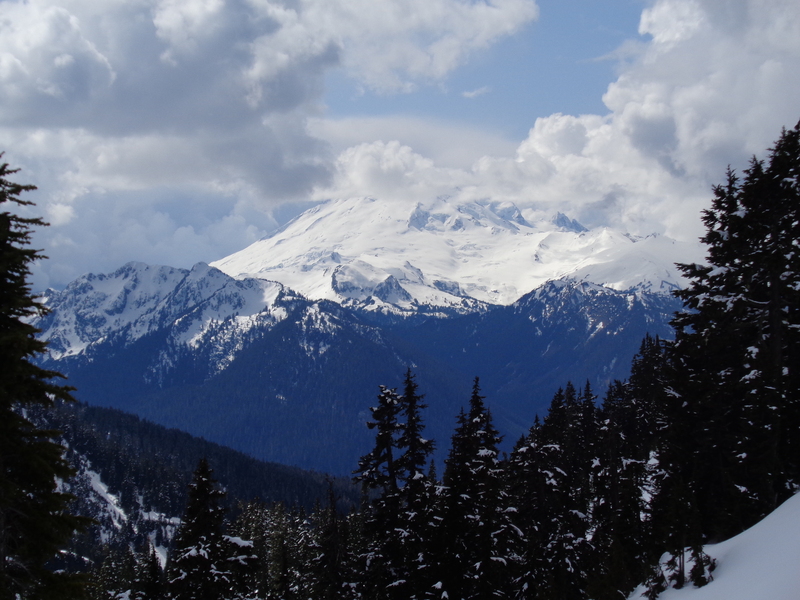 We hugged trees and rocks and skirted a small avalanche slope just below the ridge. 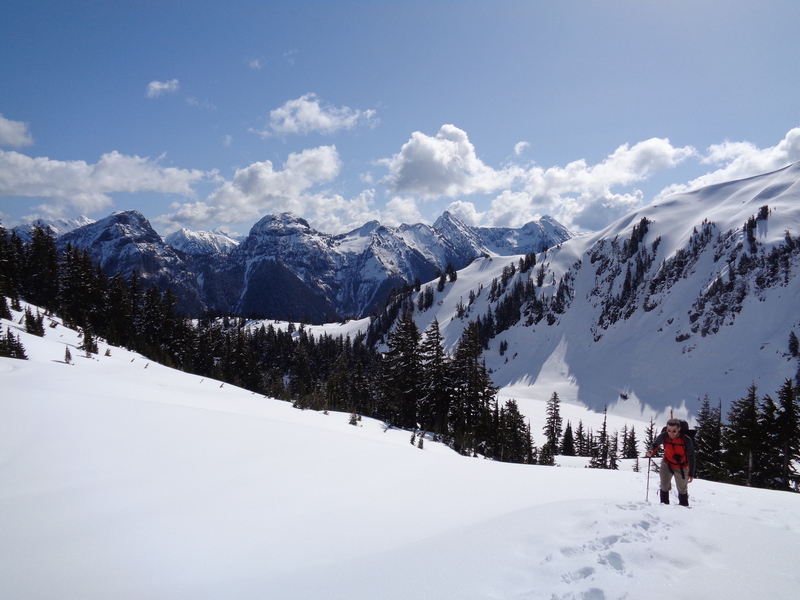 I was already iffy on conditions, and upon gaining the ridge, we realized we were standing right near a cornice. We turned left to see if we could follow it up, and were staring at another cornice several feet above our heads. Okay, so that’s not happening. We debated taking a break there, but I was anxious to get back down to flatter ground. Pinwheels, mini-slides, and we knew it’d only get worse as the day got warmer. So we backtracked to a small knoll looking at Baker. Here’s the funny part. Guys, I got some GREAT time lapses of the clouds forming over Baker. But I built a snow-tripod. Which melted. Slowly. Through each video. So once they’re sped up, you watch the camera slooooooowly tip backwards… I’m not even going to post them. All three of them, god dammit! Rocks make better tripods. Like I said, a learning experience. Avalanche terrain and hobo tripods. We descended much more quickly than the way up took us, thanks to glissading. We ran into a group of skiiers at the lakes, who followed our tracks despite our notes about conditions at the top and suggesting the winter route. I wonder if they made it, or if they just wanted to get high enough to get a good run down an open slope. I briefly considered trying the winter route, but it felt like I was trying too hard for a victory. Back at the road, we passed a group of hilarious 50-or-60-somethings having a blast: two guys on a snowmobile whooping as they dragged their buddy behind them on a snowboard. Guys, I can only hope my retirement years are that good. We cut the road switchbacks (glissading is more fun, really) and by the time we got back to the car, clouds had officially moved in. We drove out through rain, which makes me feel a bit better about not trying the winter route after our failure – we’d have had crappy weather anyway. Hindsight is 20/20. Why didn’t I read the Winchester Direct map a few days earlierearlier along with trip reports? 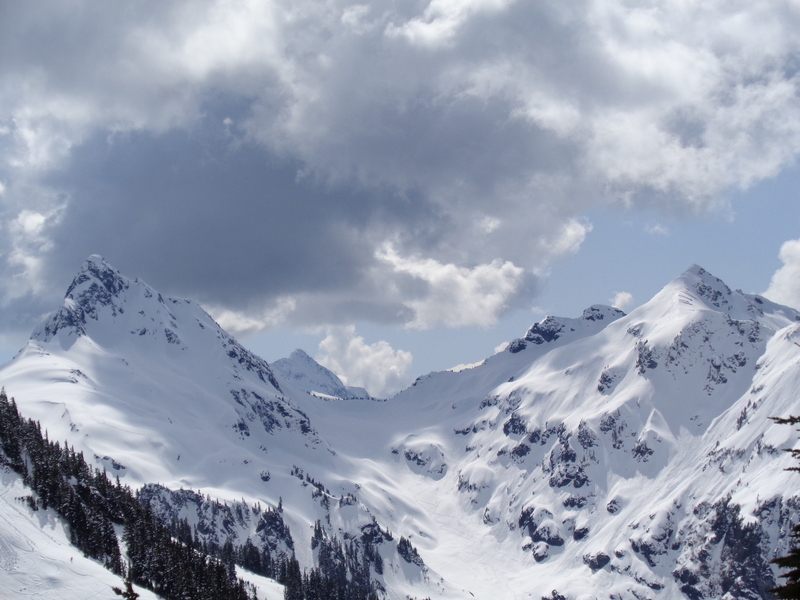 The summer route is along the southeastern face of a mountain, of course the snow would be soft in the sun. It traversed a face that was an obvious avalanche slope. The definition of “winter route” alone made it a better choice. These were all things I knew beforehand. On the other hand, the winter slope was up an avalanche chute, so maybe we’d have had to turn around anyway. I can try to justify it a hundred times, but it all comes down to me making the wrong choice. But you know what? Views were still good. It still felt like we were in the middle of the mountains in the middle of nowhere. My concerns back at Lake Ingalls were validated when Kyle agreed with me on Winchester about the dicey conditions. I know what signs to watch for, but haven’t been around enough to know when I should be concerned. At Ingalls, I wasn’t sure if I was being paranoid (after all, there was a group aiming for the peak despite conditions). So I’ll go back someday, and I’ll follow the winter route, and I’ll sit on the porch of the lookout. And I’ll drink my tea, and watch the sun rise over Mt. Baker. Get at me, Winchester. This entry was posted in Mount Baker Highway. Bookmark the permalink.